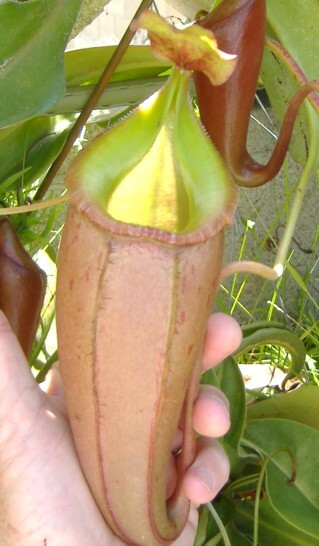 Nepenthes talangensis X veitchii is an Exotica Plants and Borneo Exotics hybrid between two highlanders. The Exotica Plants hybrid uses a N. veitchii with a golden peristome and has no barring. 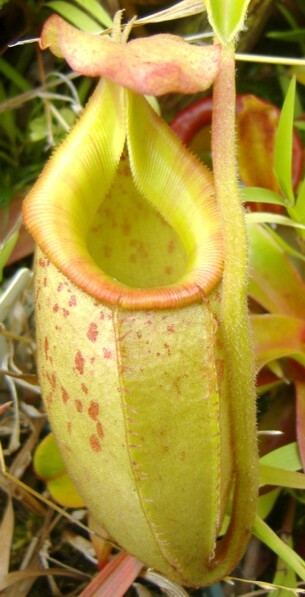 The BE clone touts that it used one of their striped peristome forms and some of the striping is apparent in this pitcher. Currently BE has only 1 clone from tissue culture and no seed grown plants were offered as opposed to the original EP plants that were all from seed. The BE clone is a very, very slow growing plant and is still a ways off from producing adult sized pitchers. The EP plant is definitely much faster growing and is now in the vining stage. Both plants grow well in typical highland conditions and may be grown in intermediate conditions since N. veitchii can be grown a little warmer than other highlanders. I think that the BE clone could be very spectacular when it finally reaches adult size. Species variability: not much among the Exotica plants; none with the BE clones.